I've got the Mosko Moto Nomad bag on my 08 and love it. There's a place for everything and even includes a hydration pack. I leave it on all the time. It's a bit finicky to get on and situated, but once it's there, it's the best I have had. I think they all do this. The GIVI has a cover for the window and instructs to leave it in place except when accessing the phone in the pocket underneath. My old BMW jacket had a clear window on he left sleeve and the plastic gave it up in one long trip. The larger GIVI bag I used had a map window. It was pretty much useless. I really like paper maps but have found that other than for planning purposes, e maps in route, are the way to go. 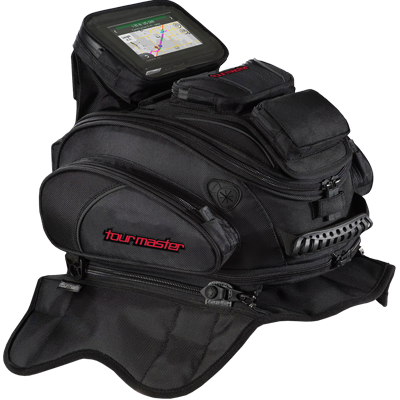 Take a look at the alt rider tank bag. it suited my needs. it unzips 3/4 for access to gas tank or all the way to remove to take into a store or whatever. plastic top for maps and interior waterproof bag for belongings. You actually carry those confounded paper things that can never be folded correctly? No wonder he acted like it was "par for the course." I never had a magnetic bag, assuming it's a good one, scratch my tank. That being said, I also have PPF on all by bikes. My other question is, is there enough exposed metal near and around the tank for a magnetic bag to stick too? I never had a magnetic bag, assuming it's a good one, scratch my tank. I actually have, I'm just obsessive enough that I check the magnets before applying the bag to the tank. Also, my Cortech magnetic bag pretty much auto-folds itself so the magnets aren't exposed when it's not on the bike. Answered my phone as I was getting of the bike so I one handed it to pull off the bag. I can still here the screw gouging my tank paint to this day. Gave the bag away. "Stickered" the scratch. Is that the one for the Africa Twin. Have you got a pic of how that sits on the tank. Appreciate seeing it if you do. I'm in the market and that one was on the list. Cycle Gear just sent me their daily sale offer. This bag looked like one helluva deal. Cycle gear wants $129.95 free shipping. or less. Here is the tank bag page.